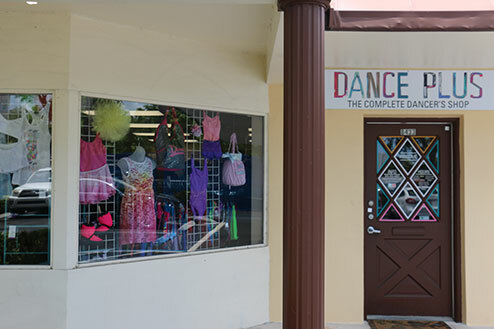 Dance Plus is South Florida’s Complete Dancer’s Shop. Located in Miami, Florida, it is the hot spot for dancers in the local community and also serves dancers and professional dance companies throughout the nation and abroad. Recently, Dance Plus announced its new owner, Diane Galt Buttner. Diane is excited to continue serving the dance community, cruise lines, and liturgical programs with the same excellent service and support that has given this shop its great reputation for over 25 years. Shopping at Dance Plus is a great experience! You are warmly greeted by a sales staff who has extensive experience with dancewear and workout attire. As dancers, Diane and her staff know how important it is to wear comfortable, high quality clothing, and look stylish too! They are also experts at helping dancers find the right shoes for ballet, contemporary, tap, hip hop, jazz, and ballroom. They specialize in fitting pointe shoes and finding the right brand that fits each dancer’s specific needs. And to top it off, they sew ribbons and elastics on purchased pointe shoes, for no extra cost! At Dance Plus, you and your feet will get the personalized attention you deserve! Whether you are a dancewear or fitness shopper, Dance Plus is sure to have what you are looking for, or they will special order it for you!